HP: 25 [+D8+Con Bonus per Monk Level]. Level Proficiency: +3 [Level 5]. Lucky: Reroll a die result of 1 and use that roll. Brave: Advantage on Saving Throws against fright. Naturally Stealthy: Can hide even when obscured by creature one size larger. Athlete: Standing from prone only uses 5ft of movement. Climbing does not halve speed. Running jumps only needs 5ft of movement instead of 10ft. Flurry: Cost 1, bonus action. Make two unarmed strikes instead of one. Patient Defense: Cost 1, bonus action. Can make the Dodge action. Step of the Wind: Cost 1, bonus action. Can take the Disengage or Dash actions and jump distance is doubled. Deflect Missile: Ranged weapon attack reduced by 1d10 + dex + monk level. If damage is reduced to 0, can be thrown back spending 1 ki point as a reaction with proficiencies and counts as a monk weapon. Darkness: Cost 2, concentration, active for 10 minutes, 60ft range. Magic darkness spreads around a 15ft radius, including around corners. Can emanate from object I am holding, but not others. Can be covered by object. 2nd level or lower light spells are dispelled. Darkvision: Cost 2, 1 action. Touch a willing creature to allow it to see 60ft ahead in the dark for 8 hours. Pass Without Trace: Cost 2, 1 action, self, concentration. For up to 1 hour a veil of silence and shadows is created for myself and companions within 30ft radius. Gives +10 dex to stealth checks and can't be tracked unless magical. No tracks are left behind. Silence: Cost 2, concentration, 1 action, 120ft range. For up to 10 minutes no sound can be created or pass through a 20ft radius sphere on a point created. Any creature or object is deaf, immune to thunder damage, and verbal spells cannot be cast. Minor Illusion Cantrip: Components: S, M (piece of fleece). 1 action, 30ft. Create sound or object. Must fit within 5ft cube and cannot have sensory effects e.g. emit light. Creature can make a successful Int. (Investigation) check to see through illusion. Weapon Proficiency: Simple Weapons, Shortswords. Tool Proficiencies: One Instrument, Dice Set. Proficient: Acrobatics, Athletics, Deception [Double Proficiency], Stealth. +1 to hit; D6+4+Dex Damage; Fire; Two-Handed. May do no damage and set an enemy on fire. Cracked Last Quip Gem: Green gem, Stolen from the Temple of Gruumsh by the dragon-warlord Gurool. One of ten magic stones scattered across the land, this gem is attuned to the Chaotic Neutral alignment. Legend says each stone corresponds to a godly avatar, but stories conflict about whether collecting them will bring peace to the world or unleash Hell. Only those sharing the gem's alignment may attune to it. It may be inset on any weapon. +3 dam [included]. Ignores Fire resistance. Last Quip When a wielder rolls a 1 for combat initiative, they join combat as though they had rolled a 2. 20x arrows. Arrows drawn from the shadow quiver are appear as normal arrows regardless of other effects. Backpack (crowbar, dark hood, backpack, bedroll, mess kit, tinderbox, 10 torches, 10 days of rations, waterskin, 50ft. of rope, disguise kit, thieves tools, night cap, burglar's pack, potion of healing, 10x Darts, Red cloak, platinum pipe, silver dragon pendant, stone dice set, large shitake mushroom, dragon tooth, grappling hook, misc clean potion, 1 healing drought 2D4+4, bottle of fine elven wine, exquisite map of Crydee, immovable rod). Black silk cloak interwoven with silver threads in spiderweb patterns. Grants poison resistance. Climb speed = move speed. Move any direction up walls with hands free. Can't be caught in webs, instead moves through as if difficult terrain. Cast web spell once per dawn and is doubled in size. Leather straps adorned with yellow gem originally worn as part of a sword sheathe, big enough to be a full-waist girdle for the diminutive Stevie. Grants protection from weather effects. Advantage on Dex. One use per day. Reality Anchor: Advantage to tests to resist displacing effects. 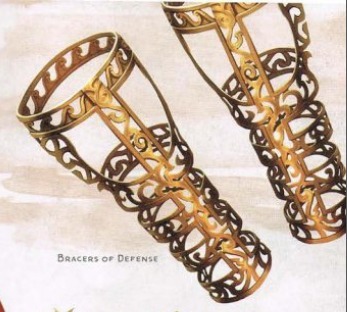 Bracers of Defense: Gold wire bracers that protect those that protect themselves. +2 AC when you aren't wearing armour or a shield.